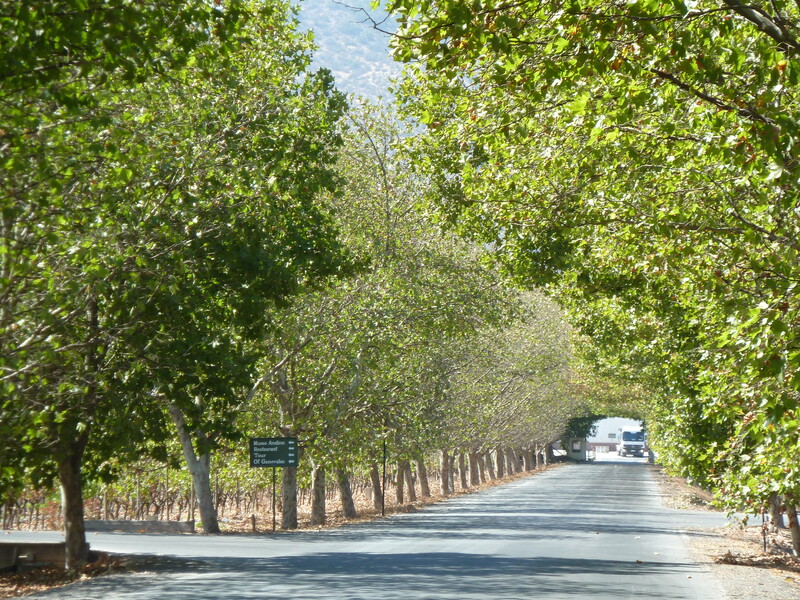 Located at the foothills of the Andes mountains, Los Dominicos is a center for typical Chilean arts and crafts. It is my favorite place in the city. I’ve been there so many times, and there are always different artisans but somehow most of my favorites have remained over the years. 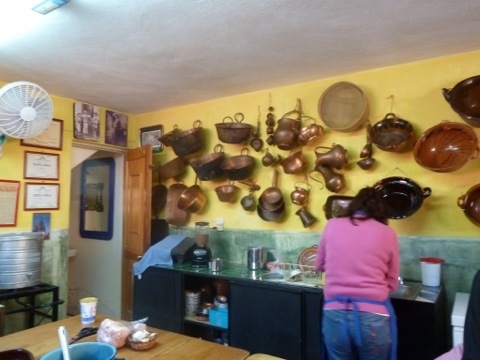 Pomaire pottery is a traditional pottery found in many homes and restaurants in Chile. You can cook in it on the stovetop or use it in the oven. I have been to the actual town of Pomaire (60 miles west of Santiago) and it was fascinating to see the pottery “fired” in the ground. The pieces are so simple, but so functional and inexpensive, unless you have purchased any of it at Sur La Table where the prices are more than 15 times the price in Chile. Some of my favorite pieces are the smaller ones used for typical Chilean salsas like pebre (cilantro, lemon juice, aji, onion) that is delicious on bread, on anything really. The small bowls used to cook Pastel de Choclo (a typical Chilean dish of corn, chicken, onion and olives) are beautiful with the golden corn topping a perfect contrast against the pottery. I’m addicted…to the food and the pottery. 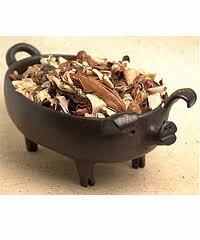 Some of the serving pieces are in the shape of a pig and come with tiny spoons made of the same material. They’re like potato chips…you can’t have just one! Once, my very tenacious mother-in-law managed to transport a very large soup tureen that she had to carry on the plane. I know it wasn’t easy but I so appreciated the effort because I LOVE it! Another addiction that is easily fed at this marketplace are woven shawls. I have them in so many colors and just like to look at them and feel them. I know it sounds crazy, but if you love textiles it’s just how it is! 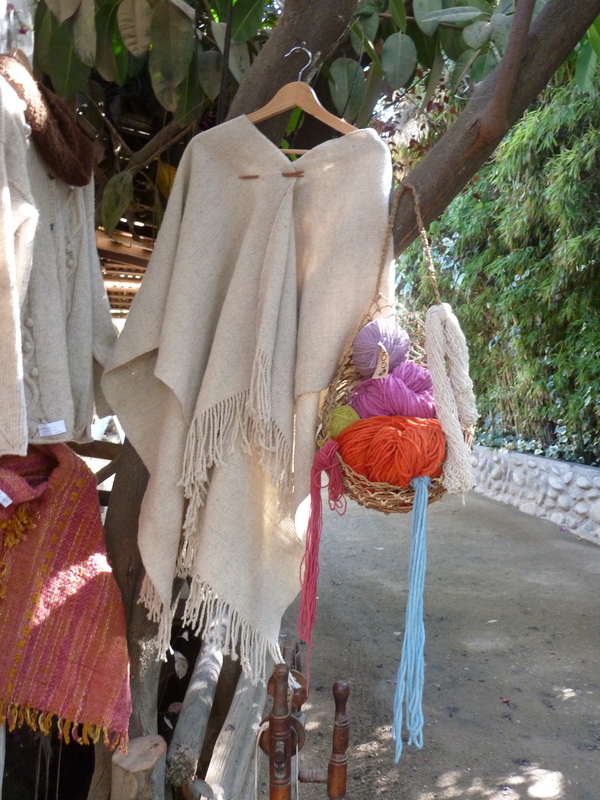 There are scarves and ponchos (much less practical for Texas weather) and most are still tinted using natural dyes. 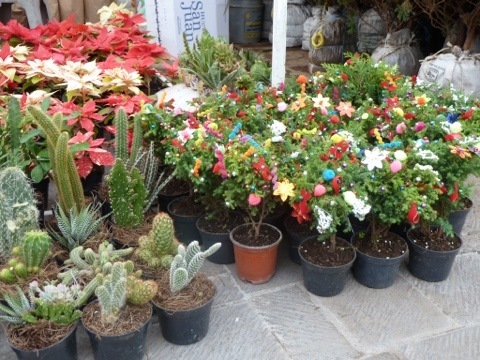 The best part of all, sitting down at one of the open air cafes inside the walls of the market surrounded by your recent purchases, sipping a cafecito (coffee), or eating a juicy Chilean empanada with a cerveza or a glass of good Chilean vino and lazily watching the world go by. Life is good! This blog is long overdue! I’m a PROCRASTINATOR albeit one that does believe that the universe speaks to us and yesterday it spoke to me. Two friends on opposite ends of the northern hemisphere both asked about my blog, and they seemed to be missing it! I was inspired and humbled at the mere thought of that. So to Reggie in Texas and Medha in Switzerland I say thank you! You really INSPIRED me to resume blogging which I really love doing and will examine why I allow life to sometimes get in the way of the things I love…but lucky for all of you I’ll save that for a therapy session. I always love to visit Chile, after all it is the birthplace of my better half! The climate is similar to that of California (always a good hair day), there is an abundance of fresh fruits, vegetables and seafood and so much indigenous art and history. Did I forget to mention the great wine? We spent 8 days in March in the capital city and one of our first stops was the critically acclaimed Astrid y Gastón (Antonio Bellet 201, Santiago) whose specialty is Peruvian food, one of our favorites. We opted for lunch as our nights were pretty booked. I so wanted to LOVE this restaurant after reading so much about it. While the food was good and served up beautifully, the atmosphere was too traditional right down to the old fashioned Villerey & Boch dinnerware. For my taste, it was not very current, fun or hip, too stuffy and little uptight…I suggest a few of their delicious pisco sours to help loosen things up. With all of the other delicious culinary options in Chile I’m not sure I would return. 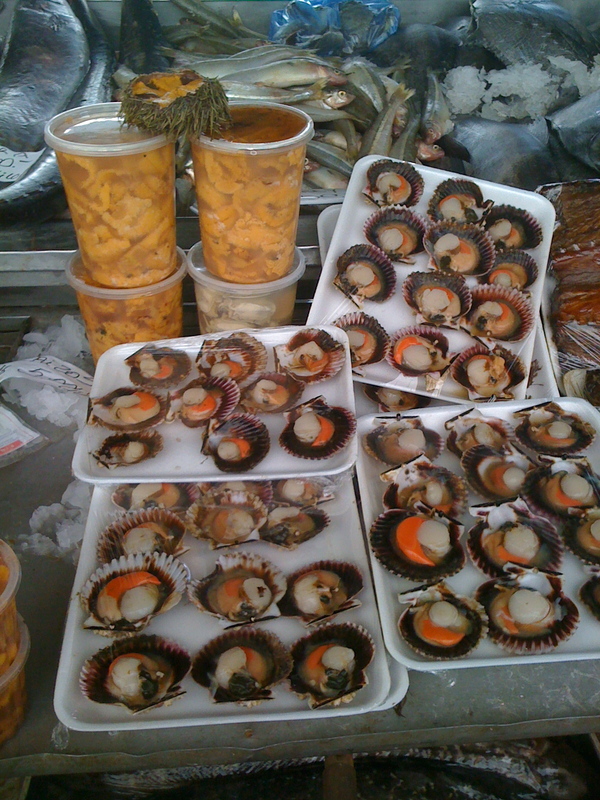 Margarita, my sister-in- law, knows of my love of food markets, so we went to the seafood market at Los Dominicos that takes place on weekends. 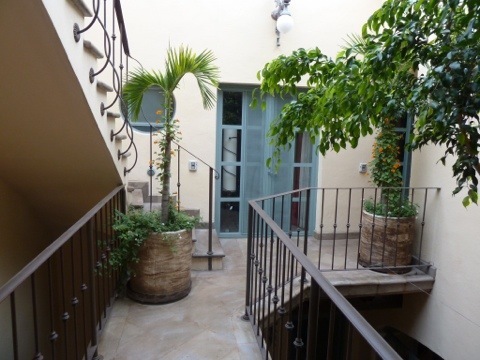 It is in a lovely location near the Artisan Market at Los Dominicos on of my favorite spots in Santiago (more on that in a later blog). The seafood selection did not disappoint…oysters (ostras), machas, a local kind of mussel/clam served baked/grilled a la parmesan with cilantro, cheese and lemon juice, fresh scallops, erizos (sea urchin, uni to sushi aficionados). Muy rico! 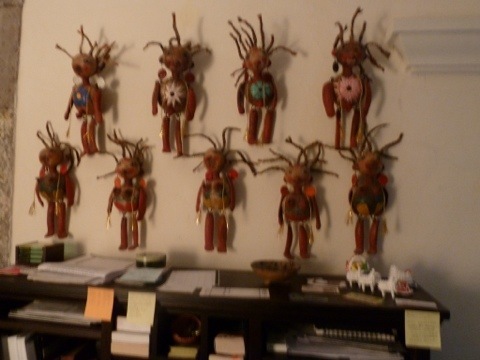 One of my favorite adventures was a trip to the Vina Santa Rita, known for its great wine, but my favorite part of the visit was the Museo Andino, a collection of pre-colombian art 40 years in the making, all collected by the owner of Santa Rita. The collection includes Mapuche (people indigenous to Chile) jewelry, Chilean huasos (cowboy) saddles, stirrups (wooden and metal), textiles, Everything was beautifully displayed and it was quite a collection of artifacts. I loved it! Well worth the drive! My least favorite part of the trip was my first earthquake experience which happened twice during the 8 day visit. Chileans like their Californian counterparts take it in stride but me not so much. One was 7.2 on the Richter scale and it was very frightening. the coffee in my cup was moving around as was everything in the room. Certainly nothing to keep me from traveling to Chile, just as they don’t keep me from going to California. Just something to be aware of and know the proper precautions. As my earthquake savvy Californian friend Lisa recommended in a text she sent me soon after the quake, “keep your shoes on the side of your bed in case of broken glass and don’t sleep naked”. Listen up! 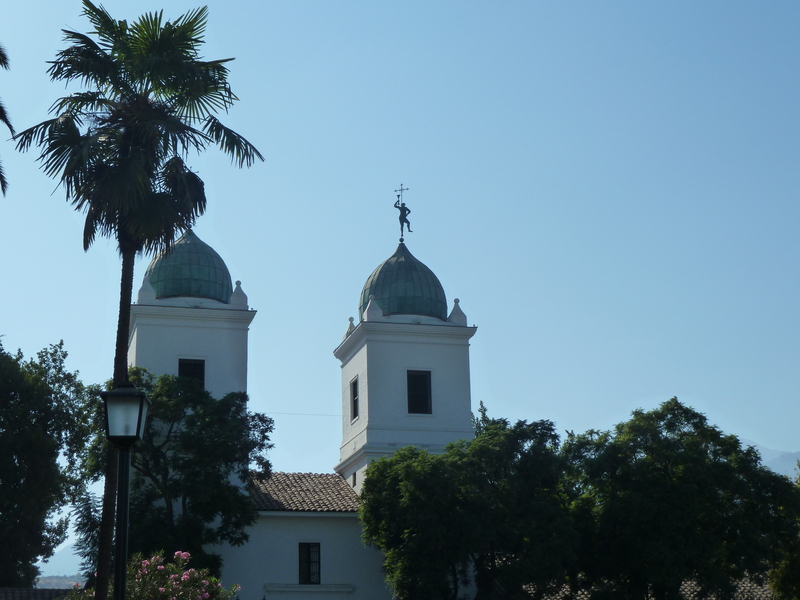 If you haven’t traveled to Chile, or anywhere else in South America, put it on your “bucket list”. You won’t regret it! 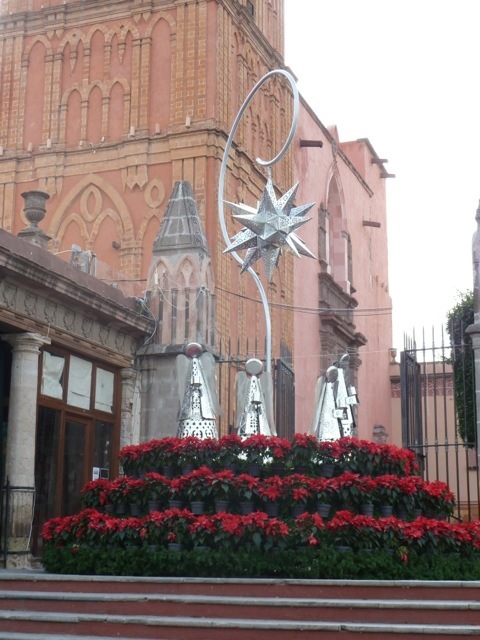 As those of you who follow my blog know, I loved my recent visit to San Miguel de Allende, Mexico. Personally when I visit countries I usually want to get away from Americans in order to have a distinctly different cultural experience. So in spite of the fact that many Americans and Canadians take up residence in San Miguel because of its natural beauty, abundance of culture and the arts, affordability and sense of community I still felt as though I was in Mexico and in no place was that more clear to me than at the Mercado Ignacio Ramirez a few blocks from the main square or as the locals call it “el jardin” . 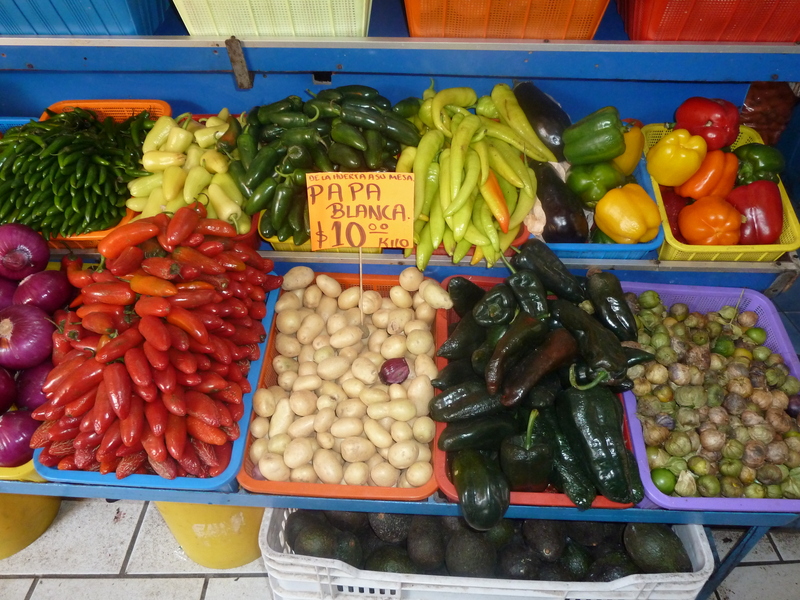 I originally ventured out on my own, as local markets are always on my “must see” list. 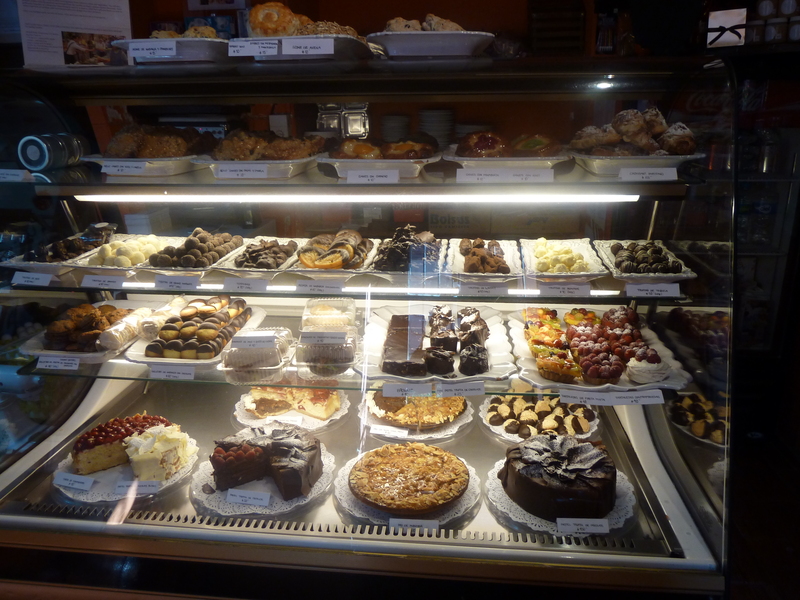 But then I met Paco Cardenas, a local chef, who owns a beautiful French bakery called El Petit Four (Mesones, #99). The pastries are delicious, the shop is lovely and you can see some of the tasty delights being made through a large window framing the kitchen. Nothing like sipping your coffee, eating a croissant and watching a beautiful chocolate ganache being spread on some fresh brownies. It was a little slice of heaven. We loved everything but our favorites were the almond croissants and the oatmeal scones. “To die for” as they say here in Texas! 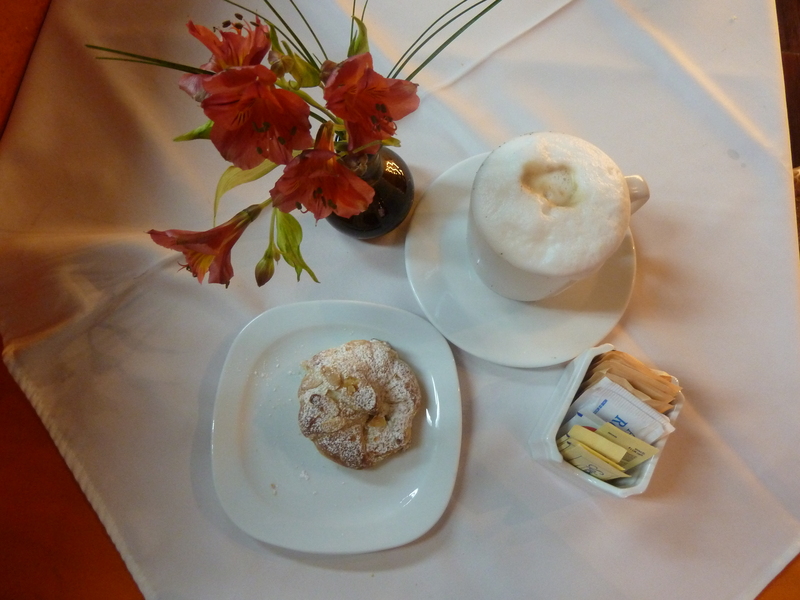 Coffee and mini almond croissant...yum! 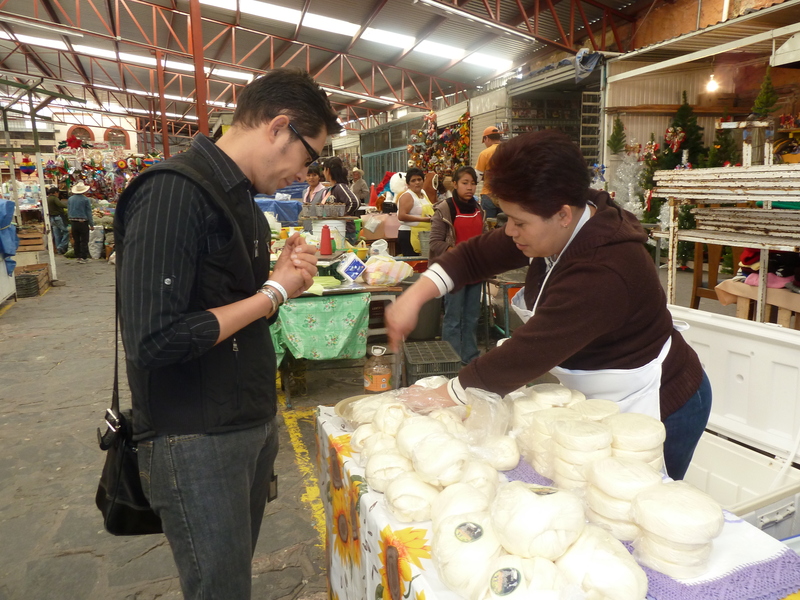 Paco gives cooking classes, market tours and combinations of both! Luckily he had time to take me on a tour of the market which gave me a distinctly different experience than I had experiencing it on my own. Alone, I had passed vendors and stands with some items that I had deemed “rotten” but with Paco I learned that these were fruits at their peak of sweetness giving meaning to the saying, “don’t judge a book by its cover”. I wish I could remember the names of everything I tasted. Luckily I did take photos of some so that I can recognize them again in the future. Seeing and eating the chick peas/garbanzo beans that I grew up with and love so much fresh from their shells was one of my favorite experiences. Like so many things we take for granted I never gave any thought to how they might look outside of the supermarket. In Mexico they are eaten the way we eat edamame at our local sushi restaurants here in the USA. Served in a plastic bag they are sprinkled with chili and lime and voila a delicious, healthy snack. 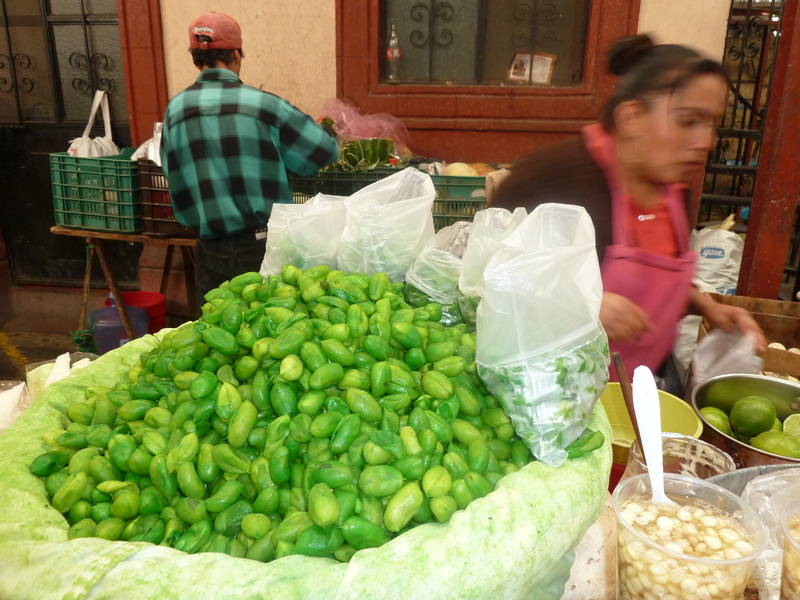 The only negative..the naturally yellow pods are dyed a bright green with food coloring which the vendors say increase their appeal to the locals. As the vendor told me, “si son amarillo, no van a comprarlos”, (if they are yellow they won’t buy them)! 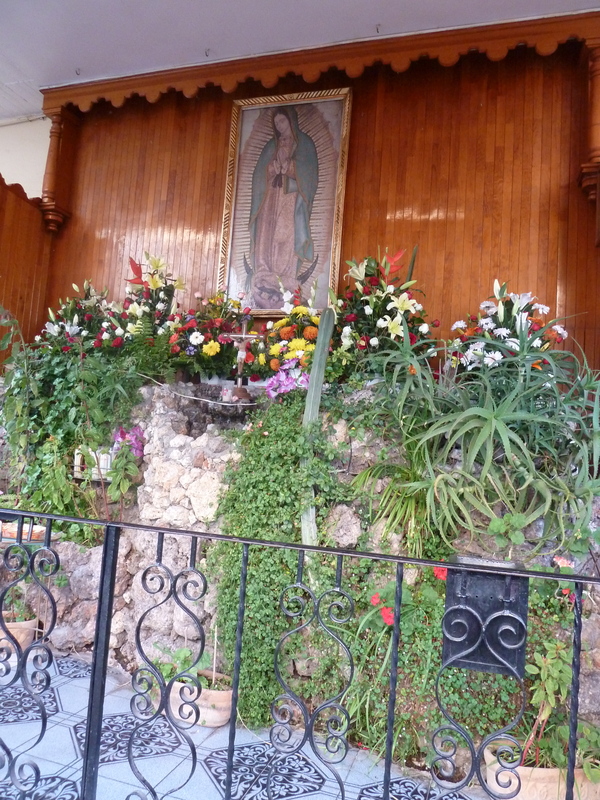 We happened to be in town for the celebration of the Virgen de Guadalupe (12th of December) Mexico’s most popular religious and cultural image. The fireworks were non-stop and the the year round shrines/altars set up to honor her were filled with offerings of food, candles and money. 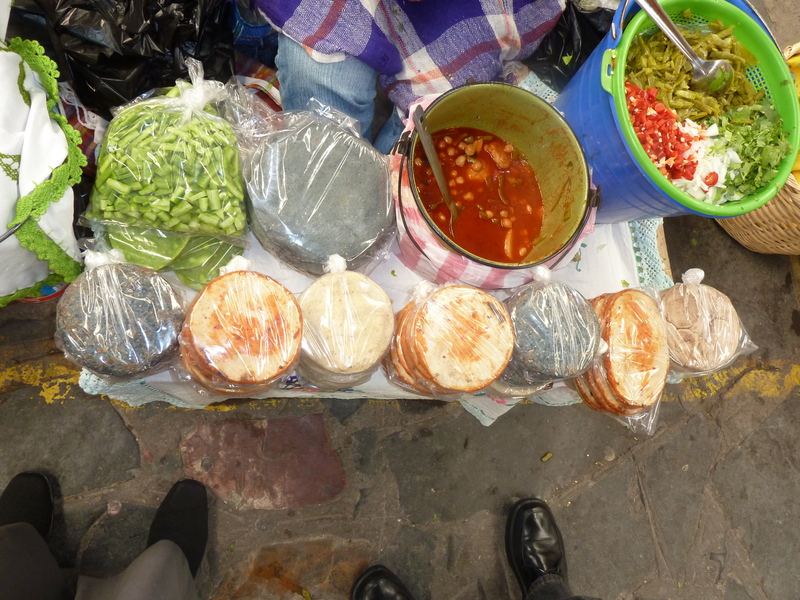 But back to the market….It was a foodie paradise and I “taste-tested” so many wonderful local concoctions. I always feels so alive at local markets, all of the hustle and bustle of the locals paired with the lovely displays of food so artfully presented generates such positive energy. Of course these markets exist in the USA, it just seems they are not as prevalent/traditional or popular as in other countries. One USA market that comes to mind is the Ferry Plaza Farmers Market in San Francisco where I first saw beautiful brussel sprouts for sale on their branches. I wanted to use them as part of my kitchen decor they were so pretty!! 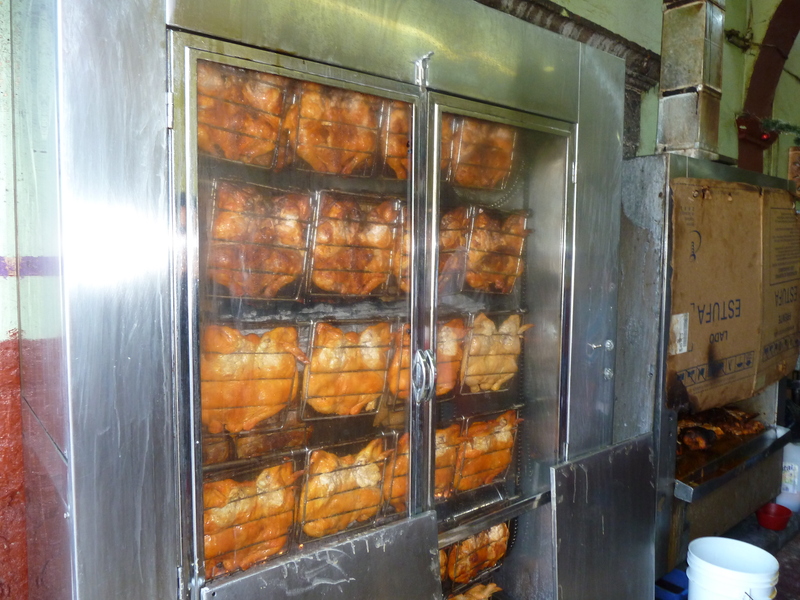 The Ramirez market tour is a great local culinary experience. 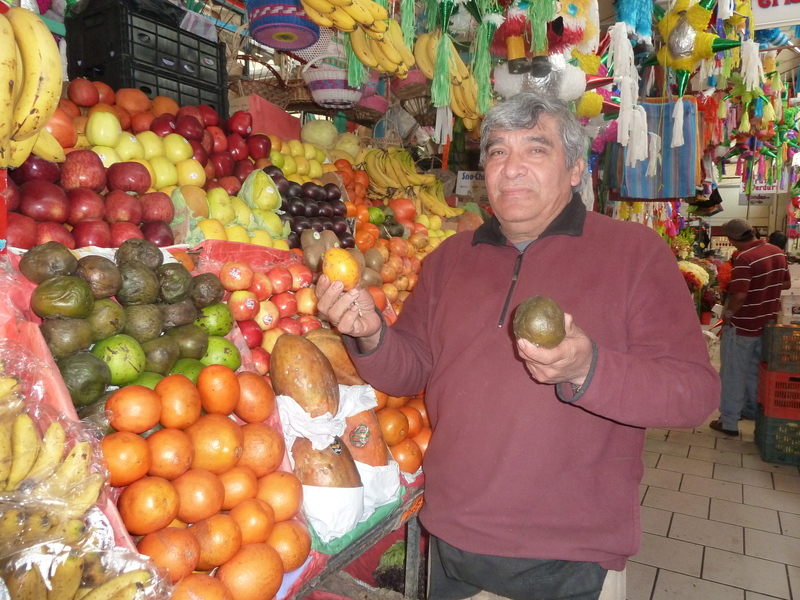 Thank you so much to Paco Cardenas for his warm hospitality and sharing his knowledge of the local markets with me. I can’t wait to go back and take his cooking class! Gracias a todos!! Wish I could remember the name of the green fruit that looks rotten. It was delicious and not rotten at all, just ripe! Amazing flavors.....how do we eat cheese vacuum packed in plastic? Like most other types of traditional pottery used for cooking, I’ve been taught to “cure” the pottery to make it ready for use. These pots are for cooking directly on the flame. There seem to be a variety of techniques for curing and here in San Miguel de Allende I have learned two distinctly different methods. For both methods the first step is the same. Step 1. Rub the unglazed outside of the cazuelas with fresh cloves of garlic, coating the entire outside surface of the cazuelas. 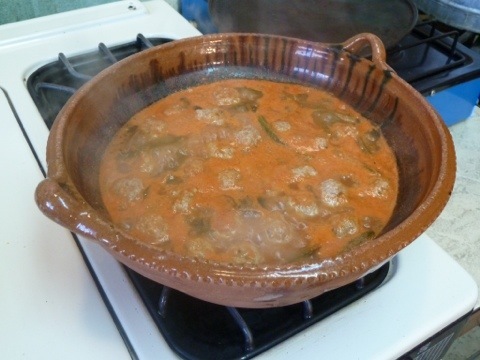 Method 1: After rubbing the exterior of the pot with garlic, pour water into the cazuela until it is half full. Place on burner on low heat until all water has evaporated. Watch carefully or pot may crack. Remove from heat and it is ready to use! Method 2: This method does not use water. 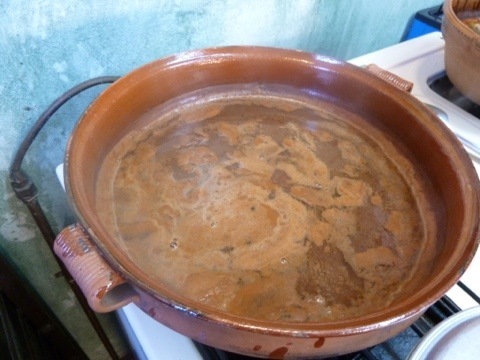 After rubbing the exterior of the pot with garlic, place a tortilla in the cazuela and cook on low heat until the tortilla turns a very dark color. Remove from heat and it is ready to use. Once “cured” the process does not need to be repeated. Never put cazuelas in the dishwasher, wash by hand. It’s like cooking in art! Thank you to Marilau and Paco Cárdenas for sharing so much wonderful information with me. 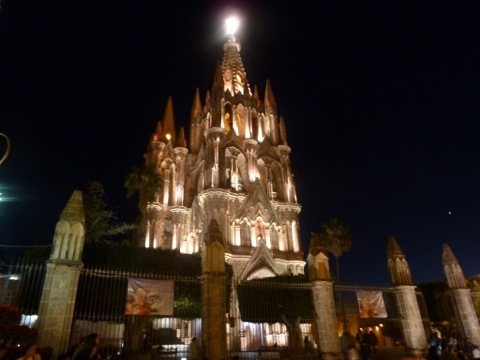 For quite some time now, anyone who knows me well and has been to San Miguel de Allende would say, “You are going to love it” and they were so right. It’s beautiful, diverse, eccentric, clean and friendly with fabulous weather. So much art and culture and history. As one woman put it when I met her and commented on how friendly everyone is she said, “We have a great life so why wouldn’t we be happy?”. What a great attitude and I feel the same way. Why wouldn’t I be happy? 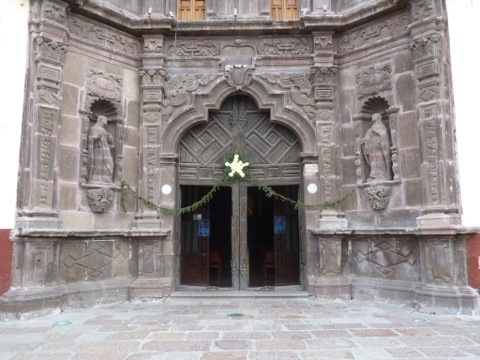 I am beginning this trip with one of my best friends for the perfect “girls long weekend” filled with shopping and eating and exploring and to top it off my husband is joining me to celebrate the wedding of the son of 2 other lifelong friends….all while experiencing the best of the Mexican culture. We are staying at Casa Florida (www.casafloridasma.com) on Hernandez Macías. 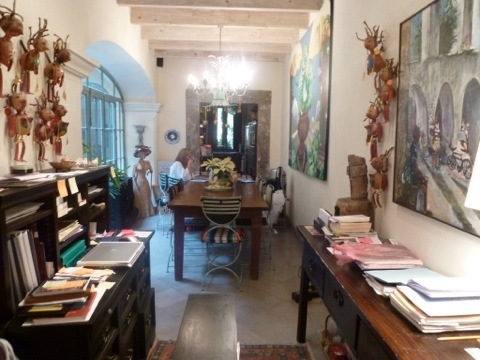 It is a tastefully decorated home, in a great location and Barbara Guyton is a very welcoming owner. The rooms are well appointed and cozy. Barbara has great taste and has renovated this lovely home to perfection. Magdalena and Dante help her at the house, you can truly feel at home here. 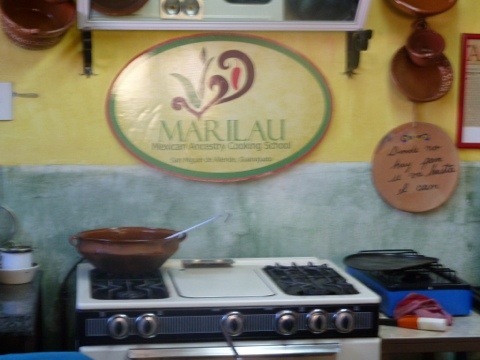 One of our first activities was a 2 hour cooking class with Marilau (www.traditionalmexicancooking.com.mx) at her home on Calle de la Luz 12. 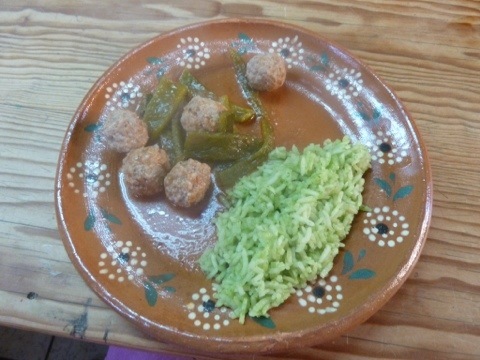 We learned about Mexican traditions, cooked authentic recipes and of course enjoyed the fruits of our labor…Sopa Tarasca, Arroz Verde ( green rice) and Albondigas con rajas ( meatballs with strips of poblano peppers). 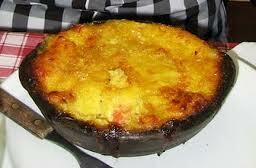 Fresh, tasty and cooked in beautiful and functional cazuelas or clay pots. I bought two for $5 USD…the exchange rate is in favor of the dollar right now! 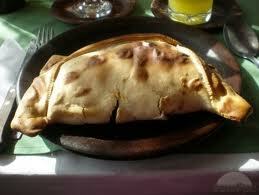 Rincon Don Tomás is on the square and a great place for a meal, or coffee and take in the sights. We loved the gorditas! Our favorite shopping spots so far…Mixta (www.mixtasanmiguel.com) for interesting jewelry that is packaged in an original way! The owner Ann is from Australia and so helpful and friendly. The shop is on Pila Seca 16A. 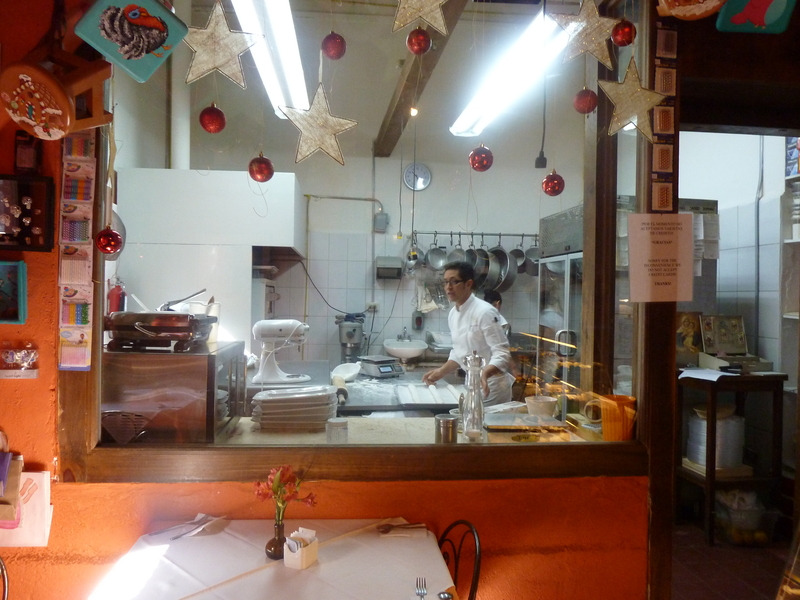 It’s so obvious that Jim and Alfredo, owners of Camino Silvestre on Zacateros No.46 LOVE what they do. They make you feel so welcome and special to be one of their clients. 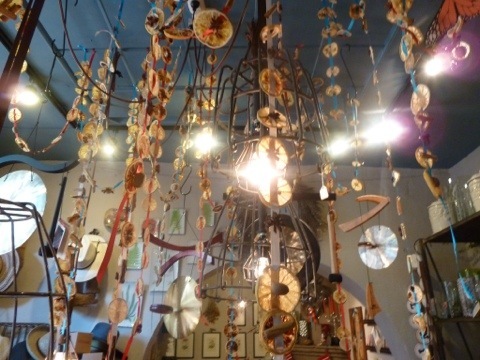 That combined with their vast array of merchandise with a “nature” theme…hummingbird feeders, garden items, jewelry, pottery, etc. make this shop a must see. My friend bought two pieces of art and they were packaged for transport and even delivered to our hotel. How’s that for great customer service? I’m going back tomorrow ! As expected there are no shortages of places to eat. .Ten Ten Pie with its outdoor seating, spicy salsas and good service was great, as was Bugambilia, recommended by Marilau, our cooking instructor. 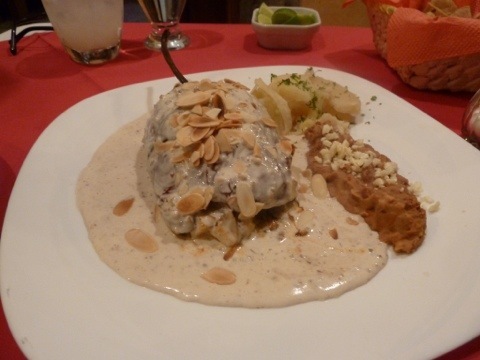 The ancho chile pepper was stuffed with meat, and apple and served with potatoes and it did not disappoint. The almond cream sauce was subtle, added crunch and the favors were just the right combo. It’s such a treat to walk the cobblestone streets never knowing what beautiful garden or antique architecture you are going to just happen upon. Wear comfortable shoes and keep your eyes open to enjoy every nook and cranny of this UNESCO World Heritage Site. Tomorrow I’m off to a tour of the Mercado with Paco Cárdenas, chef and owner of Petit Fours (Mesones 90). So excited for my next adventure here in SMA. Unfortunately my friend María will be leaving but we’ve added even more priceless memories to our 20+ years of friendship. My husband will be on his way…so all is well in my world. 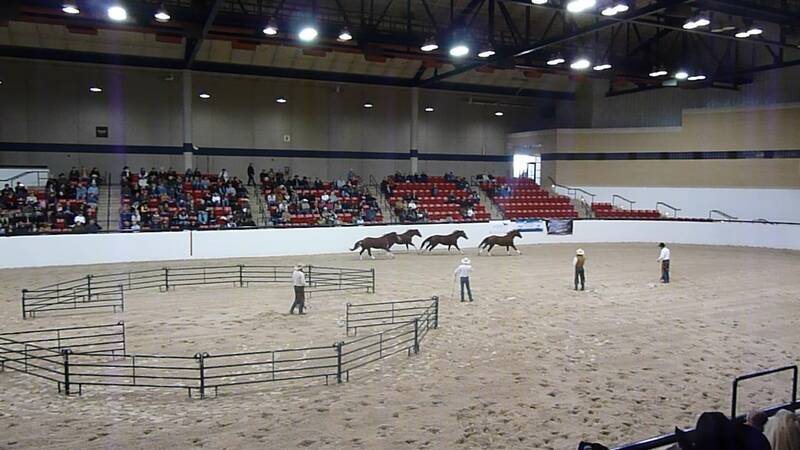 I’ve lived in Fort Worth for almost two years now and our close proximity to the Will Rogers Coliseum has allowed us to just drop in on some of the most amazing horse oriented events. Today we attended the Pat Parelli Horsemanship Clinic which was so inspiring. 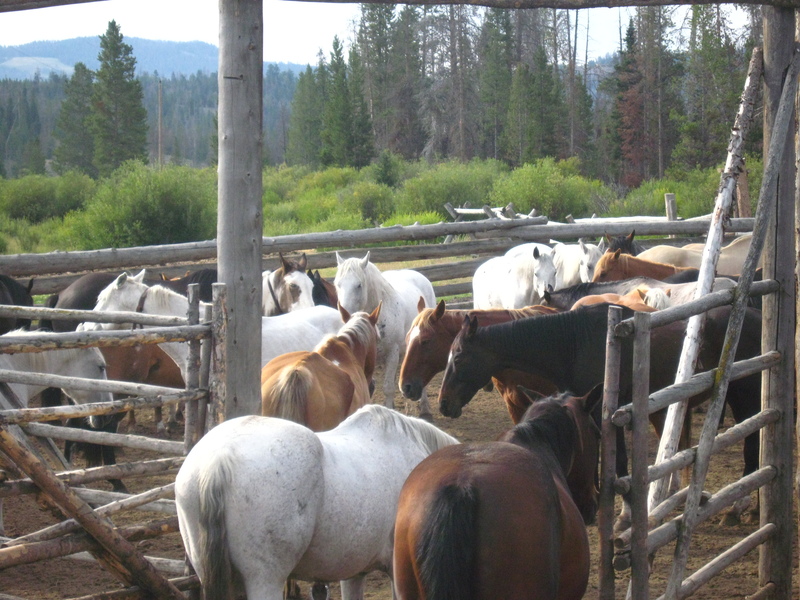 I haven’t owned my own horse for many years now, but watching what is possible using the natural horsemanship technique made the idea of horse ownership tempting once again. The horses were beautiful and the demonstrations were awesome. 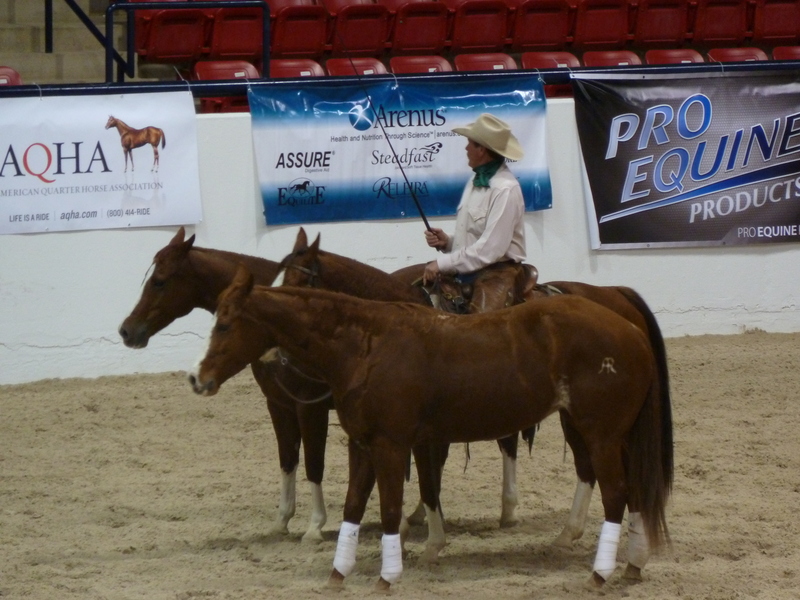 What is Pat Parelli’s definition of horsemanship? “The habits and skills that horses and human’s need to become partners”. Makes sense to me! 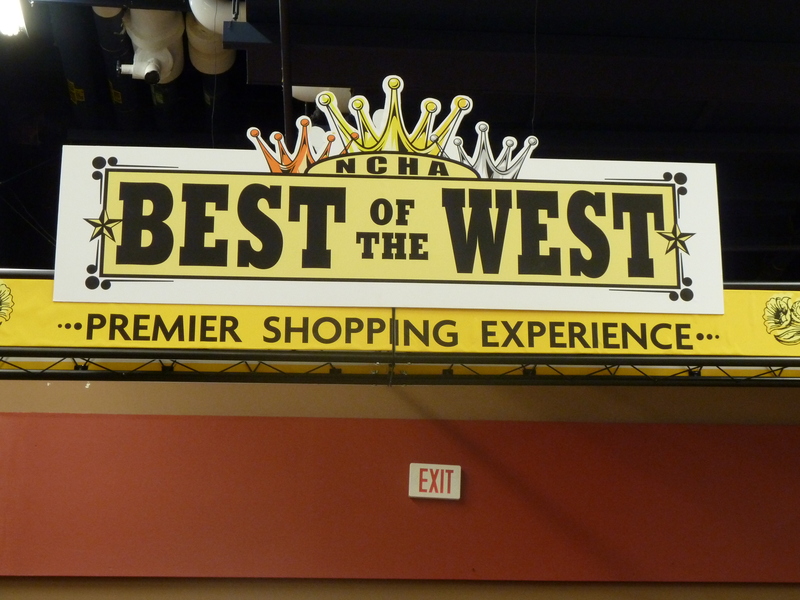 For sure one of my favorite horse show activities is shopping at the exhibit hall. It’s a cowboy and cowgirl’s dream…boots, saddles, chaps, trailors… and of course every sparkly cowgirl accessory you can imagine are all sold under one roof. Saw lots of cowgirls with sparkly headbands today. Not my thing, but I always appreciate their cowgirl style! Dubois, Wyoming is 3.5 hours NW of Casper by car. The landscape for most of the drive is austere and rugged. 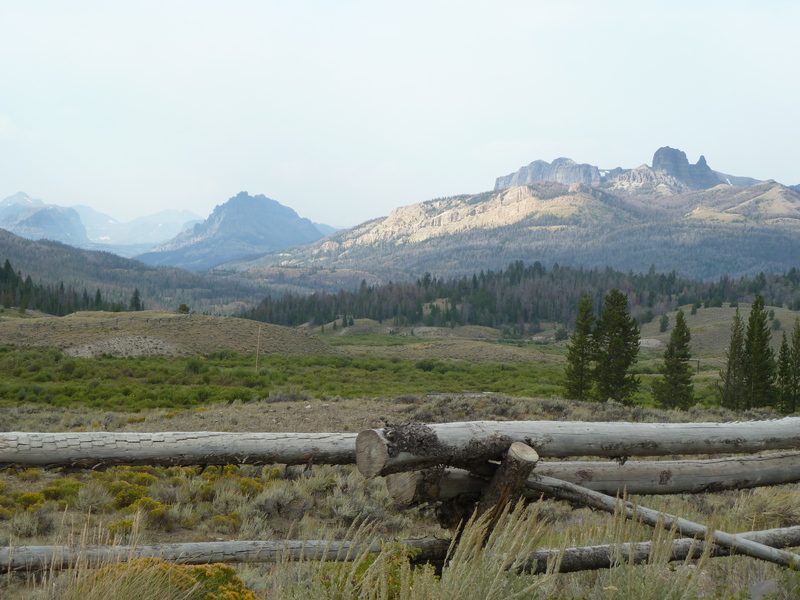 Our destination… the T Cross Ranch, a historic site, set 14 miles off the main road in Dubois in the Shoshone National Forest. 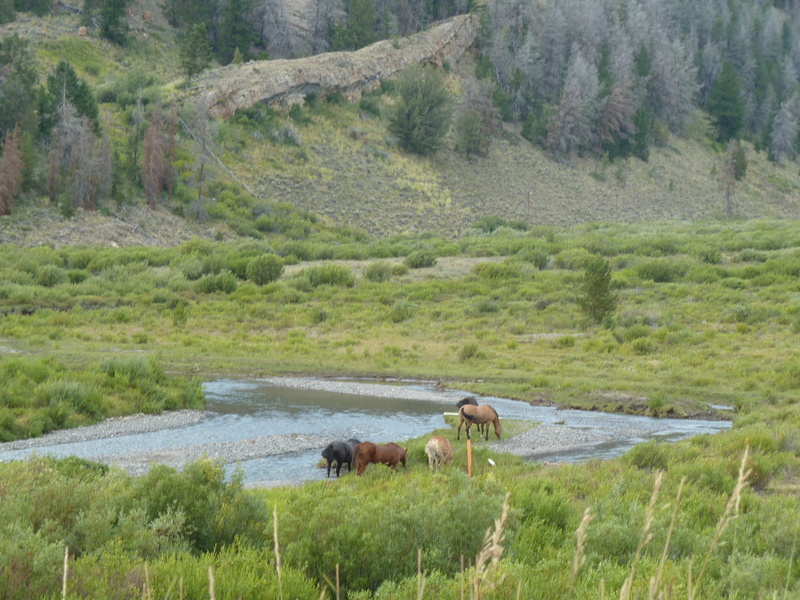 As soon as we headed into the national forest the landscape began to change and it was magical…horses grazing along the river bank, soaring mountains and green meadows. This trip was all about communing with nature on horseback…my husband is passionate about it! The scenery is breathtaking and like most times we as humans are immersed into purely natural settings, there is an immediate reality check into our truly tiny place in the universe. Horseback riding and fly fishing are the main events at the ranch and yes a river runs through it. While 6 hours on horseback, for me, is a bit much, I was able to get to places I never would have been able to access on foot. So worth the aches and pains you feel afterward. 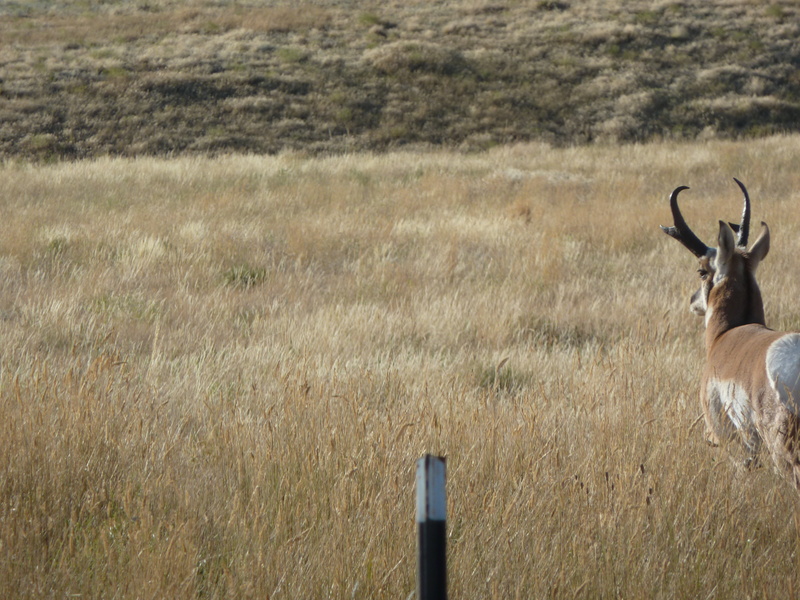 The driving force for me on these outings was to catch a glimpse of some amazing wildlife. 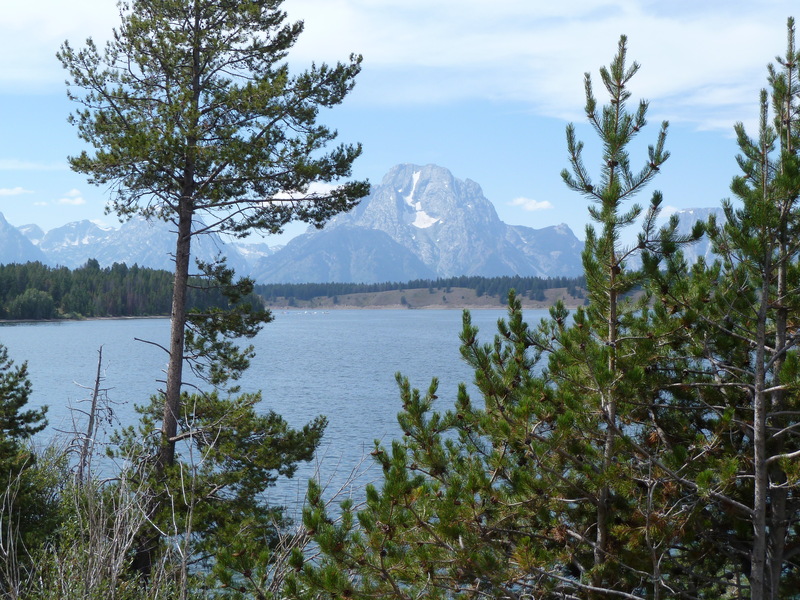 We had heard so much about the bear, moose, bald eagles, falcons, and elk that were plentiful in the area. While I didn’t want to “meet” one of these creatures up close and personal, I ooooh so wanted to see them in their natural environment. I was always certain that a sighting was imminent! In fact, the wrangler who led us on the trails carried a gun for our protection, just in case we had a “too close and/or potentially dangerous encounter” with a bear, or an irritable moose, only raising my expectations of seeing bear near the river or a moose in the meadow. I obsessively scanned the horizon and the treetops looking for anything that moved! However, aside from the horses and cows on the ranch, all I saw was a squirrel! I know it doesn’t seem possible, but it’s true! So while the scenery and peacefulness of our location more than compensated for the lack of wildlife I must admit to being a bit disappointed! If you find yourself in Dubois, stop in at the Cowboy Cafe for breakfast or one of their many homemade pies and the Silver Sage Gallery for a sampling of local art, by local artists, who you might have the pleasure of meeting during your visit! We did! 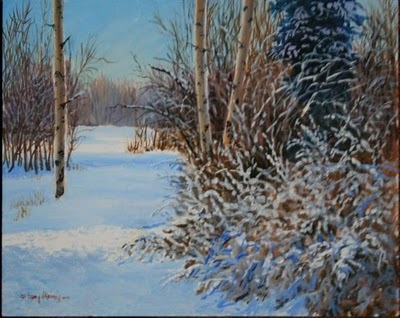 We especially liked the work of Gary Keiming (blog at: http://gkeimigart.blogspot.com) a Wyoming artist whose landscapes truly capture the spirit of the region. Gary Keimig Painting....now in our living room! 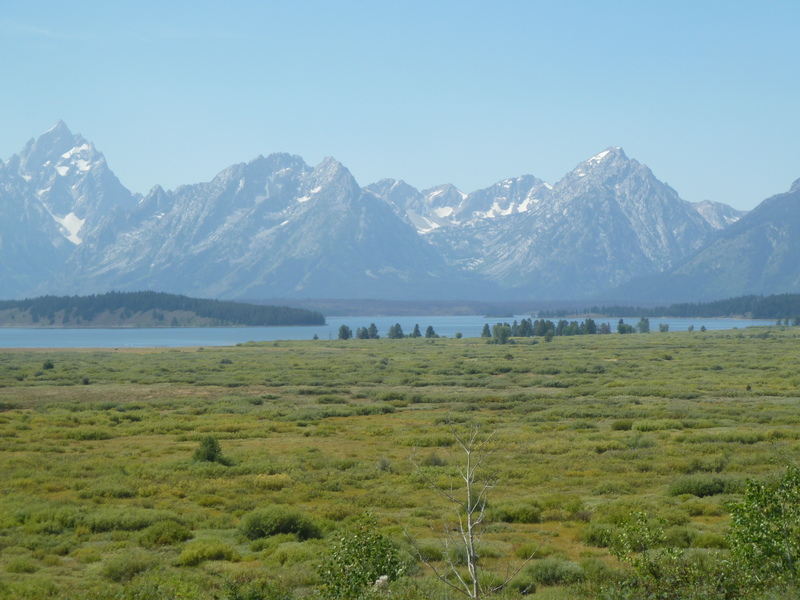 After the ranching experience we decided to drive through the infamously beautiful Teton National Park, stopping constantly to take photos. Everyone recommended lunch at the Jackson Lake Lodge located inside the park. 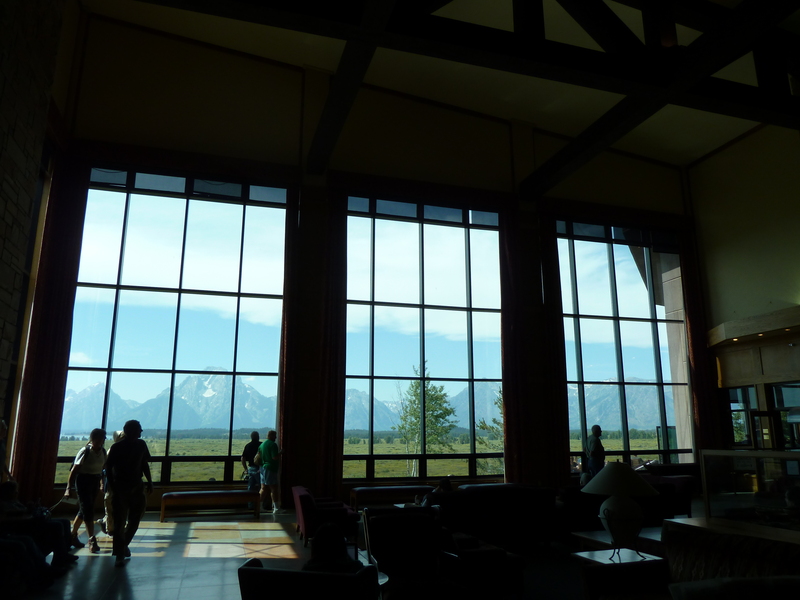 It did not disappoint…a great location with decor that could best be described in my own lingo as “casually elegant western” and the views of the mighty Tetons from the panoramic windows in the lobby were impressive. I spoke with a guest who said that many of the hotel rooms offered the same view, from which, ironically, (considering the number of people milling around with their cameras), she saw elk, moose, and deer from her window!! How unfair.. I was in the wilderness and saw a squirrel? I still can’t get over it and its been a week since I arrived home. The Snake River Brewery was at the top of our list of places to visit in Jackson as my husband had become a “fan at first sip” of their award winning pale ale. A very fun place where locals and tourists shared their love of home brews. 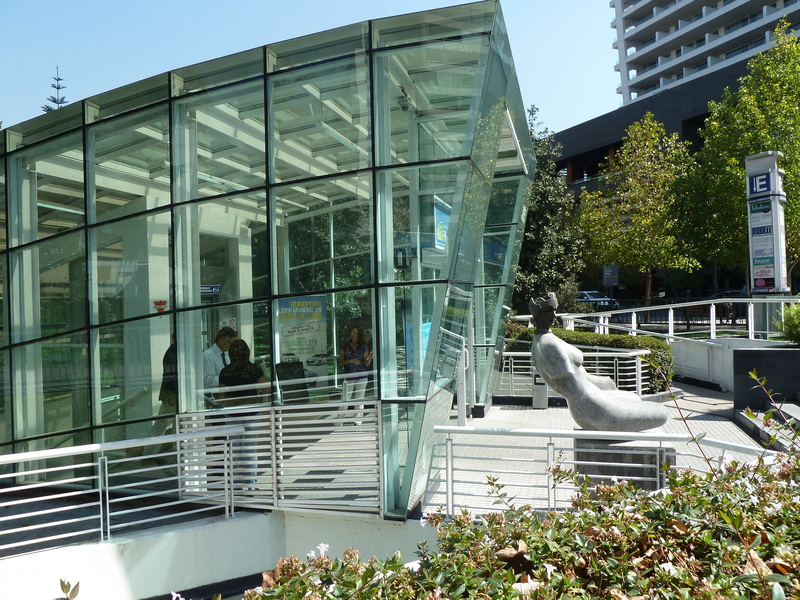 We were pleasantly surprised to find out that the night we arrived happened to be the local fall “Gallery Night” where all of the art galleries were open with local restaurants providing the catering making for a great stroll around town. 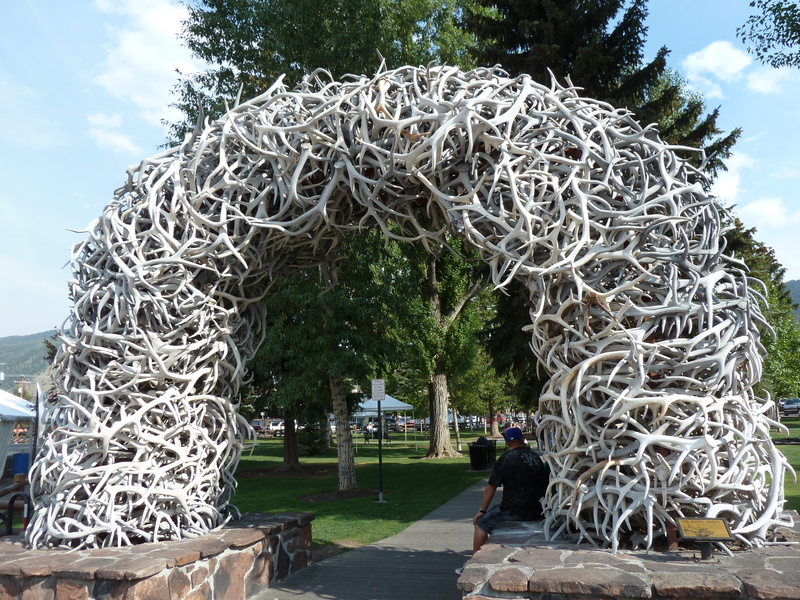 The elk horn arches on the four corners of the Jackson town square were amazing! The elk naturally shed their antlers (you know I wouldn’t like it if they were acquired in some unscrupulous fashion…) each spring and are collected by local Boy Scouts on the Elk Reserve in town and added to the arches when needed. Such a cool sculpture and so appropriate for the town. We must go back! Ciao Wyoming. 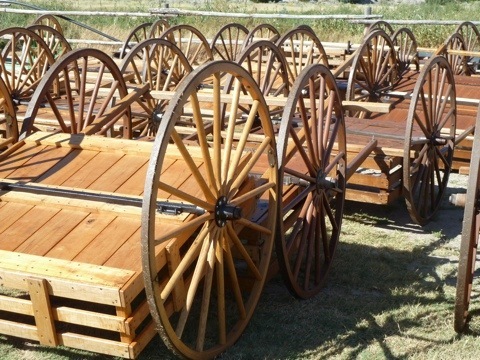 Did you know that Casper, Wyoming (the least populated state in the USA) had a historic role in the largest unforced migration in history…that of the American pioneers and their journey to the American west? Three historic trails the Oregon, California Gold Rush, and Mormon trail as well as the Pony Express, all passed through Casper. About one half million pioneers from 1843-1868 forged their paths on the way to their respective destinations. 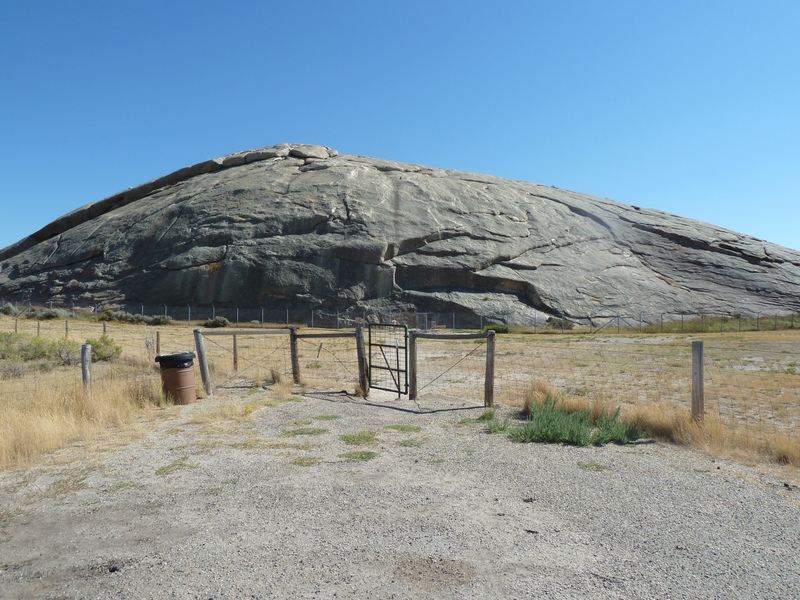 If they didn’t reach Independence Rock by the 4th of July their chances of making it safely through the mountain passes in the harsh, snowy, windy conditions was slim. The stats say that 94% of the pioneers made it alive on the 6 month journey west, which to me was shocking considering the odds against them. Of course that “shock” is coming from the woman who barely made it through the 10 hour drive to Albuquerque. 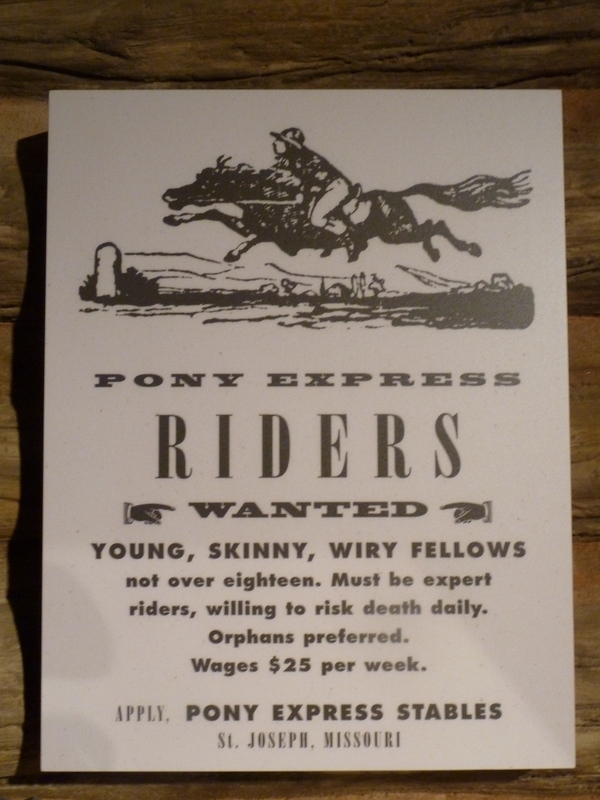 I’m certain I wouldn’t have been a good pioneer! 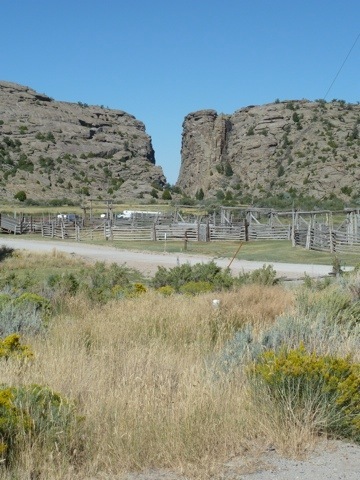 We visited the National Historic Trails Interpretive Museum and it is a must see if you visit Casper. It brings history alive. Being with my oldest and dearest friends, who have lived in Casper since 1977, was of course the very best part of the trip! Though we are separated by many miles we have such a long, strong friendship and shared history and experiences that geography doesn’t matter. Every time we visit, which is not often enough, I realize how much I miss them! A weekend of laughter, cooking, eating, drinking and solving all the world’s problems is always good for the soul! The Hatch Chile Festival is an annual event in Fort Worth, one that we all look forward to. 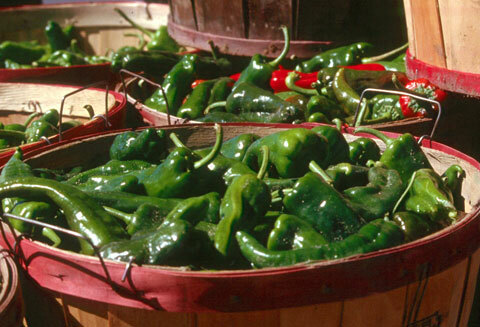 The chile peppers, grown in Hatch, New Mexico (hence the name) are taken very seriously here in the SW to the point of comparing the many varieties of peppers to the the varietal grapes grown for the wine industry. OK, maybe they have taken it all a bit too far. 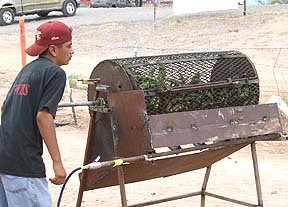 All I know is that the festival is fun and the scent of chiles roasting is delightful. If only the temperature here would fall below 100 it would be PERFECT! BTW, today is day number 65 of over 100 degrees, only 4 more 100+ days to break the 69 day record set in 1980. Truly hellish!! Back to the peppers…Central Market, our local gourmet/foodie grocery store (www.centralmarket.com) becomes Hatch chile headquarters at the end of August as it roasts and sells the peppers as well as providing great recipes and cooking demos. They believe everything is better with Hatch chiles added and they are not so wrong! There are Hatch chile burgers, Hatch chile chips, Hatch chile salsa, you get the idea! In the spirit of the festival I decided to spice up one of my favorite tomato tart recipes (thank you Marie) with the spicy green pepper. I love the tart with or without the chiles because it is easy to prepare, uses the freshest ingredients, it’s nutritious and of course really pretty on the table. Enjoy! Makes two rectangular tarts. 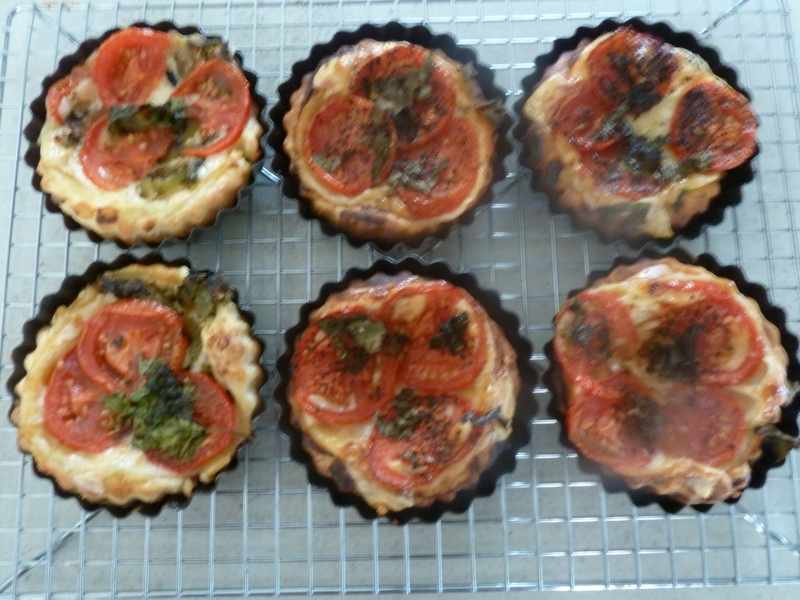 I use the French rectangular tart pans from Williams Sonoma (approximately 5” W x 18” long) or individual tart pans. Spray tart pans with Pam. Line pans with puff pastry, be sure to cover sides of pans with pastry as well as bottom. Pastry dough is very forgiving and can be cut and pasted to fit the form. Drizzle Olive oil on the top of the mixture. Bake in a preheated 400 degree oven until pastry puffs and browns, about 15-20 minutes. NOTE: For a party, you can use mini muffin pans to make individual tarts that are more “finger food friendly”. Cut the puff pastry with a biscuit cutter into circles that fit into the mini muffin tins. Coat with Dijon mustard. Chop up all of the ingredients and spoon into the puff pastry lined muffin tins. As a child I loved to read and often positioned myself with my book somewhere in our busy household where I might go unnoticed and not be interrupted by my parents or siblings. Then, like now, a good book and the gift of a child’s imagination, had the magical ability of transporting me to far off lands. I still love books, and I especially love cookbooks, often reading them cover to cover like a novel. My favorite cookbooks go beyond recipes to include historical information about the source of the food, or the recipe, or of the particular culture the book might represent adding another dimension to the cooking/eating experience. Today while reading my recently purchased book on Moroccan food, “Tagines and Couscous” by Ghillie Basan I was so motivated by the stories behind the traditional dishes of Morocco that I was compelled to visit our fabulous local Central Market to search for the ingredients I needed for 3 basic dishes. Craving some exotic flavor, I chose to prepare the spicy eggplant and tomato salad, chicken k’dra with turnips and chickpeas, and the plain, buttery couscous. Interesting name as the recipe was anything but plain. The couscous was infused with the flavor of toasted almonds, olive oil and butter…yummy! For those of you who love couscous the book is worth buying just for the two page description of the history of couscous and the art of making it (not cooking it) which is very labor intensive. I learned that Moroccans believe couscous is a food that brings God’s blessing upon those who consume it and I can see why! Don’t be put off by the title of the book, even if you don’t own a tagine you can re-create the recipes in a covered casserole. I used a Le Creuset 5 quart covered casserole for the chicken dish, “braising” the chicken similar to a tagine. 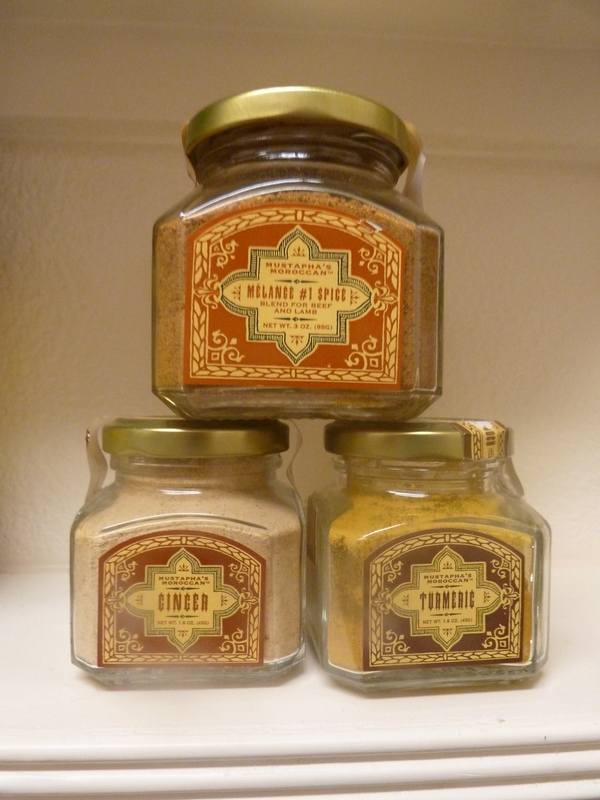 It is best to review the recipes first and make a list of the spices needed to duplicate the Moroccan flavors. The spices, while not hard to find, may not be a staple in your kitchen pantry and there is nothing worse than starting to prepare a dish and not have what you need…plus searching for the ingredients is part of the adventure no? The photos in this cookbook are beautiful too! 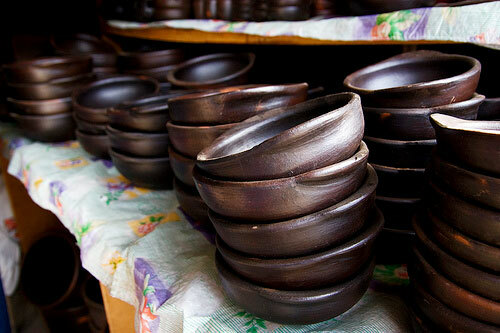 There are colorful and tempting photos of the food and local pottery. I served the couscous and the eggplant in Chilean pottery I purchased years ago in Pomaire a small village west of Santiago Chile where the pottery is still pit fired (heated in the ground vs. an electric kiln). 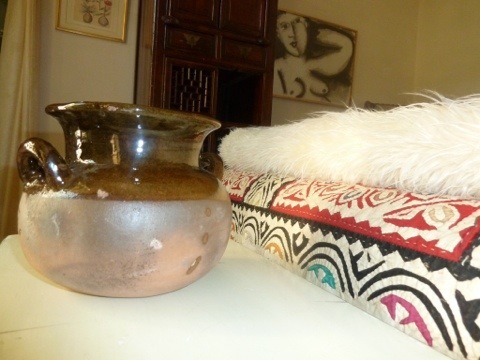 While Chile and Morocco are thousands of miles apart there is a strong similarity to their traditional clay pots. Not surprising really…if I’ve learned anything from my travels one thing stands out and that is that regardless of differences in geography, culture, language, religion or race, people and the things they care about share more similarities than differences. We just need to be open to the possibilities. The same goes for food. I’ve been wanting to go to Morocco for some time and it has moved up the ladder on my bucket list of places to see before I die. But for now reading the cookbook and trying as many recipes as possible will have to be enough. The food is amazing! Enjoy!